When I was a classroom teacher, I was always searching for new ways to present or introduce concepts and additional resources to teach effectively. This was especially true when I taught College Algebra, as our textbook was somewhat lacking (in my opinion), and I didn’t even have a teacher’s manual. If you are struggling to help your kids make sense of math concepts, or you just need some new ideas and resources, I would encourage you to explore Study.com. There are numerous benefits and ways to use Study.com, whether you are a classroom teacher or homeschool family, so learn more in my complete Study.com review below. Study.com is a site full of more than 22,000 video lessons to explore all sorts of concepts for K-12 and beyond (not just math). There are also other, written lessons that you can print out to use as supplements to various lessons in your curriculum. In addition, there are more than 4,000 complete online courses, including those that are available for high school or even college credit. While I don’t have the time or space to explore every single aspect of this vast site here, I do want to focus on how Study.com can help you to be a better, more confident math teacher. One thing I want to note before diving into the review is that there aren’t many video lessons available for grades K-2 math. There are printable lessons available though, so you could still use it as a resource for planning out your lessons and ideas. If you teach upper grades though, I think this is an especially useful resource. There are so many different ways you can use Study.com if you are a classroom teacher. Here are some of the greatest benefits that I have found. First of all, you can use the video lessons to introduce a new concept. The videos are fairly short, focusing on a single topic, making it an easy way to introduce something. Likewise, these videos are the perfect way to review or reinforce math concepts. This is especially helpful for kids who are struggling and may need some extra reinforcement at home. Another great benefit that I have found is that there are so many lessons available, you can likely find a new approach or real world example to help bring math alive. Though not all the lessons are video lessons, you can easily print out a lesson and use it as a script to help you teach and discuss a concept with your students. While I would not encourage you to give these printed lessons directly to your students (especially grades 2 and younger), you could certainly use it as the backbone of your lesson or class discussion. This is especially true if you’re struggling to find a real world example of a math topic. 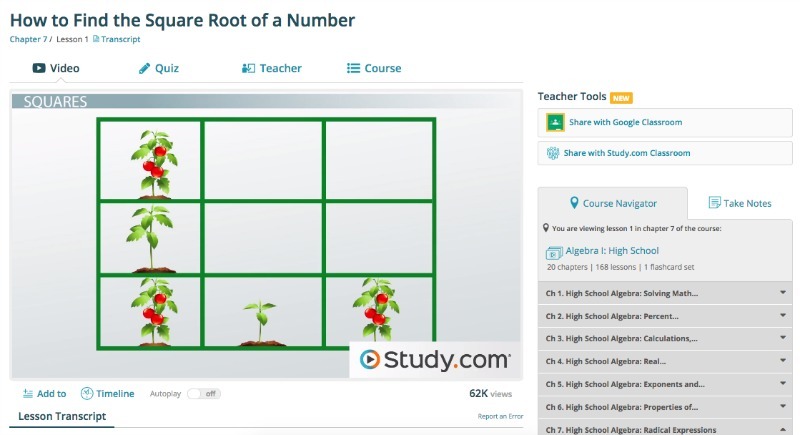 It’s always important to explore math through real world problem solving, and a quick search of the relevant lessons on Study.com can help you find examples. Another amazing benefit is the option to create an online “classroom.” This is your online space for students to come to to see their assignments and complete them. 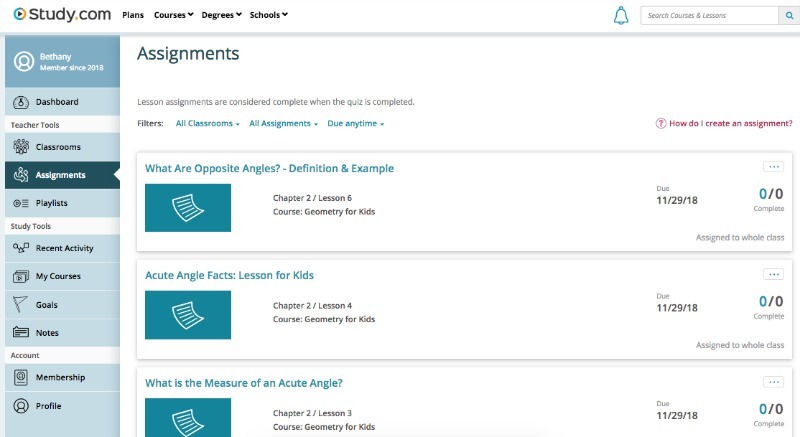 Setting up the class is easy, and you can then add any lesson from Study.com as an assignment for each class. What’s especially great about this, is that you can assign a video lesson to your entire class (say you want them to review at home what you learned in class) OR you can assign lessons to individuals. This makes differentiating and supporting all students easy! If you have kids with significant gaps in their learning, simply find helpful video lessons within Study.com and add them as assignments for that student. Then they can complete the lesson (and quiz) on their own time and you can monitor their progress. See all the additional ways Study.com can help classroom teachers here. There are also unique advantages to using Study.com if you are a homeschool family. Although the above benefits are certainly still true for you, here are some additional benefits. 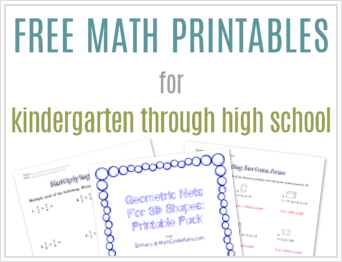 No math curriculum is going to be a perfect, one size fits all option for your family. But with Study.com, you can easily find video lessons that cover concepts that are lacking in your current curriculum. Or you can simply provide additional ways for your kids to see and explore a concept beyond what they’re learning from their textbook. While I absolutely believe that math should be learned with hands on manipulatives and paper and pencil practice, it’s always nice to change things up. Weaving in additional video lessons as introductions, review or enrichment can give your kids a break from the regular math routine and maybe give them an understanding that they didn’t have before as they see a concept taught a new way. Plus, the videos (at least the ones I have viewed–admittedly, I have not seen every math video on the site!) 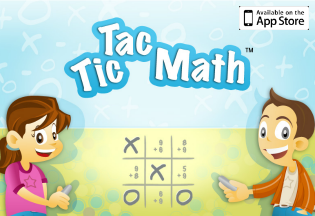 are engaging and approach math concepts in fun, relatable ways. If the thought of teaching high school math scares you, check out Study.com! There are complete courses available for all high school math options. Plus, each lesson includes a quiz, and each chapter includes an exam, so you can easily track their progress. In addition, there are “homework help” courses, so if your child is completing a high school geometry class and is still confused, simply find additional geometry videos to continue learning and practicing. Another option is to use Study.com as a summer resource or review for your kids. So while you might be taking a break from formal lessons or your traditional curriculum, you don’t want your kids to stop learning. Study.com is a great option to keep kids learning and practicing during the summer. Especially if you have kids who are behind or struggling with math. This is likely cheaper than a private tutor! If you have a high school or college age student, you can even let them complete certain courses for college credit. This could save time and money if your kids have several courses done when they get to college! Similar to AP courses or dual enrollment, kids can complete online courses at Study.com for a fraction of the cost of community college. These credits will then transfer to over 2000 colleges and universities in the United States. Learn more about earning college credit here. Finally, I want to briefly share how Study.com can help you if you are in school to become a math teacher! Yes, they even have video courses for that! All of us who have taught in the classroom know there are lots of hurdles to earning that degree and teaching certificate. One of those is passing standardized tests such as the Praxis. Many states also have additional testing requirements. The frustration for many is that without a passing grade, you have to continue to take the tests over and over, which costs a small fortune. Taking the time to complete the study guide courses on Study.com may be the help you need to pass these certification tests the first time! Learn more about preparing for the Praxis here. While there are tons of benefits to using Study.com as a resource in your home or math classroom, it’s not cheap. So you will certainly have to consider how you want to use it and then see how it compares to other options. 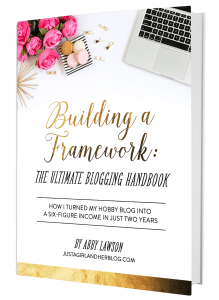 Whether you are a classroom teacher or a homeschool family, you will probably prefer the “teacher” plan. This allows you to create unlimited online classrooms, which means you can assign videos or courses to multiple students. The teacher plan is $59.99 per month. Though that seems like a lot, if you homeschool multiple kids and they are each completing multiple courses through Study.com, this is much more reasonable. Learn more about the teacher plan here. And although this is a little pricey, you can cancel anytime. So if there is a particular course or concept you want help with or you want your kids to work on, you can pay for the months it takes to complete the course and then cancel until you need it again. In addition, there are options for schools, allowing multiple teachers to get access at a group rate. If this is a resource you’re interested in, I would definitely talk to your school about getting a group rate. And if you just need extra support and supplements for your child, you can always sign up for the basic monthly plan which is $39.99 per month. These lessons don’t include quizzes and assessments, but still give you access to all the lessons. See the individual pricing plans here. 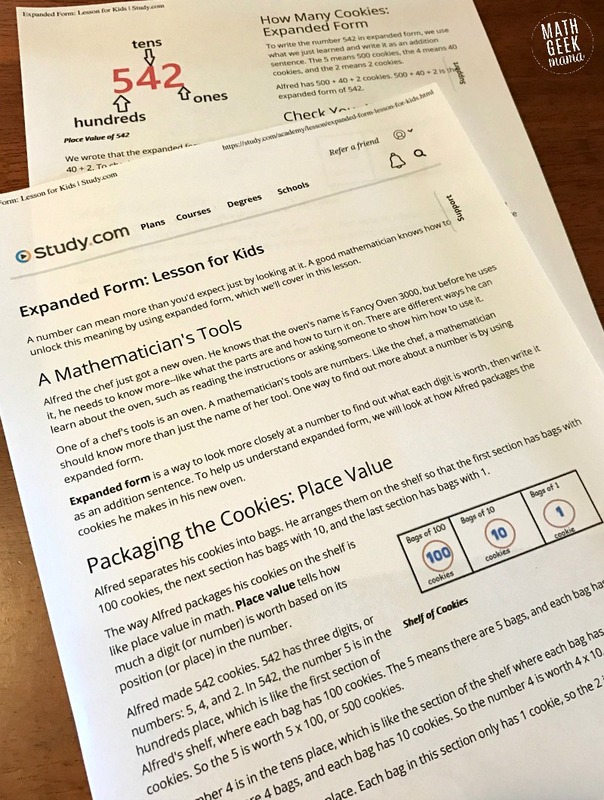 If you are interested in trying out Study.com, you can get a reduced rate just for being a Math Geek Mama reader! Have you used Study.com before? Have a question still? Share your thoughts in the comments! Want to hear what others have to say? See more testimonials here.